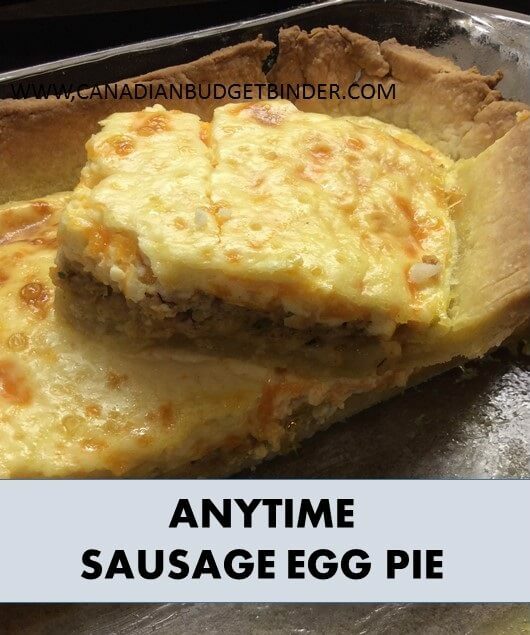 If you enjou sausages, eggs and pie this anytime sausage egg pie is a great addition to your weekly meal plan as it freezes well plus you eat it anytime you’d like. Now that’s homemade cooking convenience. This week was all about cleaning out the freezer to get it ready for another freezer inventory so I make sure we are using up the food and it’s not getting freezer burned. Since the kids were back to school and the husband off to work after the holiday it meant time for recipe creations in the kitchen with no distractions. Since the house was quiet and I was relishing the time to myself I had realized around 11 am that I had forgotten to take something out of the freezer for dinner. Into the freezer I went to search for some sausage meat which is the same sausage meat I make my delicious British sausage rolls. Once I decide on something to take out of the freezer I then must come up with a recipe for it. This forces me to think of a new recipe that I can create for my family so I’m not serving them the same meals over and over. My family has come to love the variety of dishes and snacks that I serve them which makes me a happy mom and wife. Since my Turkey Pot Pie was a family success I thought I could use the same pastry and make another variety of pie. I did think of doing Quiche but they’ve already had that before and then a light went off in my head. Sometimes I get part of my inspiration while enjoying a hot cup of tea and just thinking to myself. It just happens that way, haha! This time I had a Ah-ha moment with-in minutes. Why not make a sausage egg pie? 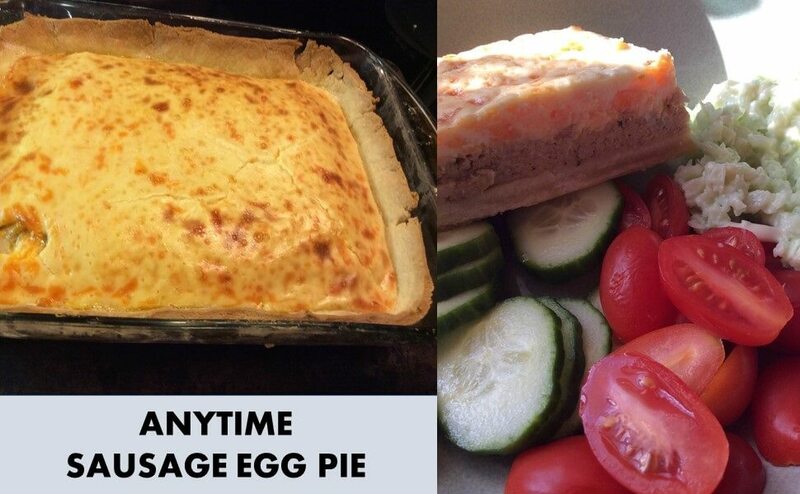 The sausage egg pie would be delicious hot but even better cold with a salad during the week for lunches. This would be great to serve at breakfast with some hash browns and fried tomatoes. The Sausage Egg Pie would even be better served cold at a picnic or pot-luck! I like to create simple budget-friendly recipes that I can use for multiple meals not just one time of day. I have to admit my sausage egg pie lunch on Tuesday was divine and far better than eating a boring sandwich. I doubled the amount of my pastry mix and didn’t use it all but saved it and put it in the freezer as it keeps well for up to 4 months. This is just a little tip that not many people know so instead they toss it in the garbage. No… don’t waste it. Anytime sausage egg pie is great for any meal of the day as the name suggests. The best part is that you can pair it with multiple side dishes such as salad, soup or even crunchy vegetables. Stir in the egg and yolk and mix until it forms a soft dough. Wrap and place in fridge to chill. Mix the sausage meat, parsley, turmeric, garlic, Tabasco, paprika, salt and pepper until it is well combined the. Set aside. Make pastry let cool and roll out to fit 33 x 22cm (3L) lasagne dish. Making sure it goes over the side by pressing slightly with your fingers. Cut off any excess. Then make your quiche topping by combining the eggs, miracle whip and milk until thick then add your cheese and mix. Press into the bottom of the pie dish the sausage mixture next making sure the whole of the bottom is covered. Then finally top with the quiche mixture. Place in the oven at 210oC/410oF for 30 minutes. You don’t have to settle for the same foods day in and day out so do your body and taste-buds a favour and experiment with foods that you have on hand or try recipes like the one’s I create here for you. Enjoy this Anytime Sausage Egg Pie. This recipe sounds good. I’d play with the flavouring to make it work my family but otherwise it would be something that I would make.